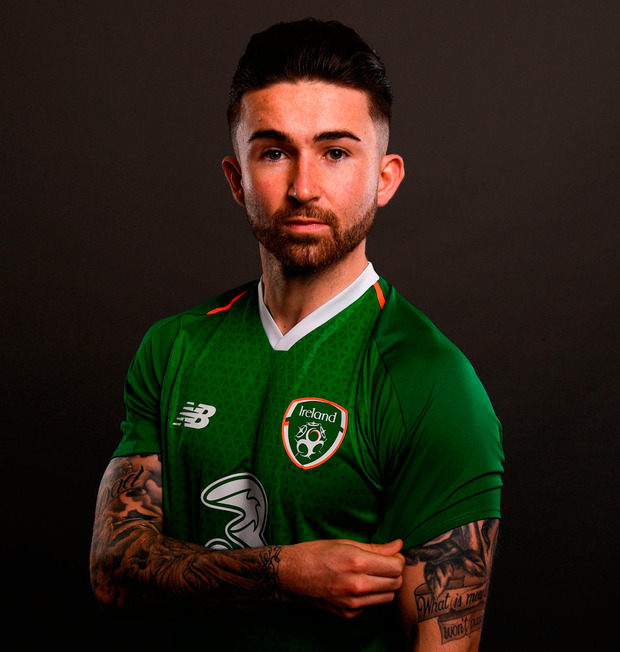 A year has passed since the Aviva Stadium rose to acclaim Seán Maguire, with a late substitute appearance against Moldova capping the year of the Kilkenny man's dreams. His prolific run with Cork City had earned a transfer to Preston and the opportunity to play senior football for his country. Maguire recalls sitting on the bench watching James McClean's winner in Cardiff and thinking he might get the opportunity to figure in the drama of the play-offs. But his own personal momentum-stopper was coming around the corner. He was absent from the games with Denmark because of a serious problem with his right hamstring that required surgery. The 24-year-old did return in time to start March's friendly with Turkey and play a part in Preston's unsuccessful attempt to reach the play-offs, but another setback ruled him out of the summer internationals. After a pre-season of working towards hitting full stride again, his left hamstring went in the final warm-up match. It kept him out of action until a sub cameo against Wigan last Saturday and a role in a badly-needed victory that moved Preston off the foot of the table. "These past ten weeks have probably been the toughest in my career to date," said Maguire after linking back up with his Irish team-mates again. "I was sitting in here this time last year having never had a hamstring injury before and now I've had two pretty serious ones. Struggle "The injury last year was my first (long-term) injury and it flew by. This time, I was watching the boys struggle. We have been bottom of the league for most of the season. "But what will be, will be and everything happens for a reason. It was a huge lift coming up Saturday and to be called up here after only playing 20 minutes is a great honour as well, to see what the gaffer thinks of me as a player." O'Neill had suggested initially that Maguire might just come into train, but the player was thinking in different terms after Wigan. He acknowledges that he doesn't know how many minutes he could manage and O'Neill is also conscious of looking after Preston's player when they had agreed to let him travel - other clubs may not have been so willing. Maguire has become incredibly important to the club that he joined from Cork City just 15 months ago. Through their recent run of form, the one potential chink of light was a return for Maguire and the front man is aware of the responsibility it brings. "There is a bit of pressure there but we have been scoring a lot of goals," he counters. "I think we have scored 18 goals and that's maybe the most goals of the bottom half of the table (Aston Villa actually have struck 20). It's at the other end where we have been leaking them. We kept a clean sheet on Saturday and scored four." Two of those were scored by Callum Robinson, an Irish recruit who has stepped into Maguire's shoes during his unavailability. The pair get on well and Maguire and Alan Browne played their part in Robinson turning green. He spoke to the duo a year ago about the FAI interest arising from his Monaghan roots and they encouraged the ex-Villa youth to follow up on it. Robinson started in Wales and is trying to convert himself into a No 9 having played a lot of football on the wing previously. His colleague feels they have a good understanding on the pitch and could see that emerging as an option for O'Neill. "He's been flying," says Maguire, breaking into a smile. "I kinda killed myself on Saturday, I set him up for a goal when I should have went for it myself. Towards the end of last season he scored a lot of important goals. And this year he's been our best player at Preston. "I think he was probably our best player against Wales. It was a tough night for him against a good Wales team with a new manager. "I played on the wing at Preston and he has played there and both of us can do a job as a No 9 too. If anyone has looked at the games where we have started together we have interchanged all the time and we can develop as a partnership with club and country." Maguire might have to be patient this week and referenced Aiden O'Brien's strong showing in Poland too. Still, a run-out at some stage against Denmark and Wales would mean a lot after the hard work he has put in. The player is conscious that he needs to mind his body going forward. O'Neill has expressed concern about the hamstring strife. Maguire must now report for Preston training 45 minutes earlier than the rest to go through his own warm-up procedure and he's also come to Ireland with a training programme for extra gym work in the evenings. Lengths Back in England, he's even gone to extra lengths over the past month to look after his muscles. "A couple of times a week I get a guy up to help me out - that's to loosen out my glutes to help my hamstrings," he explains. He concedes that his style of play might make him vulnerable to this particular problem, and altering that might blunt his main attributes. "There's only two speeds with me, either walking or sprinting," he says. "When we don't have the ball, I'm walking back and when we have it then it's a just a burst of energy. I've had to work on that a bit over the 10 weeks, where I've had to change my game a little. But I don't think I'll be able to do that (longer term).Changing my game would hamper the way I play." He's ready to go full throttle again now.